Meditation is the essence of spiritual practice. This is a time when your consciousness changes moving away from a routine thought process and emotions. A crystal is a wonderful tool for meditation. It helps tune our consciousness to the source. It aids us in taking the quantum leap that attracts our soul toward the light. The stones and crystals are significant entities - living, breathing, transmitting, interacting, shining , pulsating. They emit vibrations and frequencies that have very powerful potential effects on our whole being and can be used for healing , transforming, balancing, and attuning body, mind and spirit. Crystals and stones are manifistation of light and life, colors , textures, vibrancy, transparency , clarity. Their beauty is magical , mystical and mysterious. They are the stars in the Earth in wich the qualities of clarity and light have been bestowed. This luminosity in the stone is a symbol of high evolution. In the miniral kingdom there exists this aspect of spiritual growith, reaching for perfection, towards the light, just as in the plants the stalks grow upward - striving toward that same light. The basis of this method is a sincere opening of Self towards the Divine Consciousness-Force. This superconscious Force descends into a body of a person changing and making him progressively the Divine. We prepare an altar using the four elements: light a candle (fire); bowl of water or a vase of flowers (water); light incense (air) ; and crystals (earth). We start with special movement wich will open and clear our energy flow . Next step heartwarming practice for heart chakra opening, its is the center of unconditional love. 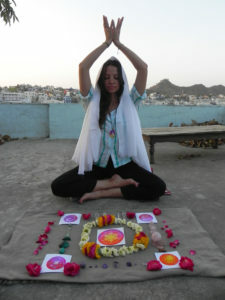 You will be able to choose few different crystals for meditation and healing session. During practice you will drive into a beautiful Harp sound journey and while enjoying the smoothing sound of Harp, crystals will give you treats with energy clearing and healing. Elena practices Hatha yoga since 2006. In 2011 she moved to India and live there for two years, learning spiritual practices from Indian Yogis and Sadhus, esp energy clearing and different healing practices. Also she developed technics for helping people to settle in their true nature. Following our true nature will bring joy and happiness into our lives!